Hey, it’s nonfiction time! I picked this one up a few weeks back and thought it was pretty fun — or as close as academic pop culture analysis gets to fun. In case y’all haven’t noticed before, comic book superheroes tend to be an awfully pink bunch of people. Plenty of people wish that were different, and that comics more closely resembled our multicultural society… and unfortunately, a lot of other people seem to wish that comics were even more white than they are now. 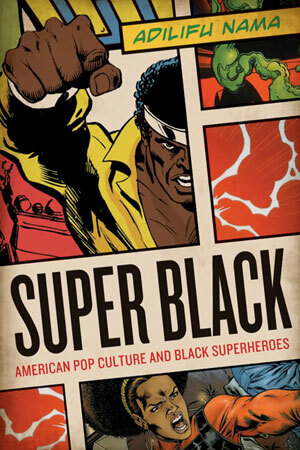 So it’s nice to see that someone has put together a history of black superheroes and how they’ve affected our culture. The book starts out focusing on comics’ earliest attempts to address racial injustice, particularly in Dennis O’Neil’s and Neal Adams’ “Green Lantern/Green Arrow” series. From there, it’s on to the first important black superheroes — Luke Cage, the Black Panther, John Stewart, Black Lightning, and the Falcon. And Nama is very careful to note how they fit in with the comic companies and within pop culture — John Stewart as an outgrowth of O’Neil’s political-themed comics and Black Lightning as the first African-American hero at DC to get his own title; Luke Cage and Black Panther as reactions to blaxploitation films, and the Falcon as possibly the most important black hero — he shared co-billing with Captain America, got serious stories about race relations into the comics, and was the first black superhero to be able to fly. There are, of course, plenty of other characters discussed and analyzed, as well as how they influenced and were influenced by pop culture, politics, and current events. There’s a whole chapter on black superheroes on film — but far more interesting is the lengthy discussion of the 1970s blaxploitation flicks — and how they often made the most sense when you thought of them, not as private eye or crime films, but as early superhero movies. Verdict: Thumbs up. It’s a solid and deeply interesting piece of analysis. This is the kind of material that gets short shrift in a lot of comics histories — usually confined to a few pages of the single “Oh yeah, here are the prominent black, Hispanic, and female characters of the ’60s and ’70s” chapter. This is all really pretty entertaining stuff — the first chapter or two are very heavy on the academic language, and I was initially worried it’d be pretty dry and inaccessible. But once the book hits its rhythm, it really pulls you along. It’s a good, fast read, and it’s hard to put down. If I’ve got a complaint about this book, it’d be that there are some really great characters who get very little to no attention. Milestone’s comics in the ’90s are discussed in only a couple of paragraphs — and dismissed as unimportant. Now I know — anecdotes aren’t data, but I’m a member of a Milestone Media fan page on Facebook, and everyone there sees Milestone as not just important historically, but inspirational as well — there are members there who loved Milestone’s books so much, they decided to create their own comics. That’s not an unimportant comics publisher — that’s a publisher that changed things. Still, you got any interest in comics, history, diversity, and racial politics? You’re going to want to pick this one up. Copyright © 2013 Hero Sandwich. Powered by WordPress and A Dream to Host theme by Art of Blog.